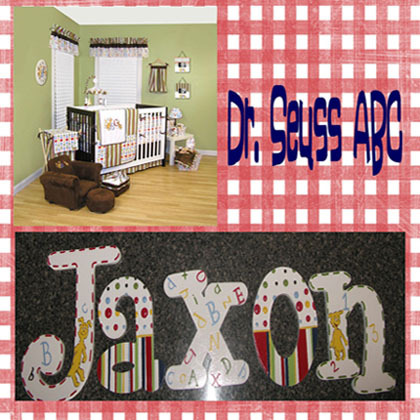 These fantastical Dr. Seuss ABC letters are painted in beautiful bright primary colors with Dr. Seuss's pup characters adorning some of the letters alternating letters have abc's and 123's and stripes with polka dots. These letters are 7" Inch unless you upgrade. Other sizes available are 8", 10", 12" and 14" (for an additional fee) There is an additional cost to have only characters and to drop the striped letters. All Capital Letters are also more. You may choose how you want your letters to hang; Ribbon is .50 per letter, Sawtooth Hangers are .60 per letter, and Mounting Tape is .55 per letter. You may also choose no hanging method and decide to do something on your own after you get them. See Hanging info for a description of each of these options. Letters are made by hand by myself and take approximately 8-10 weeks for completion. If letters are needed sooner you can purchase a rush order available for purchase in the store.